Situated close to Walking Street, this affordably priced hotel offers clean and comfortable rooms amidst a quiet setting. The rooms are equipped with TV with lot of channels and comfy beds. Breakfast is also included as part of the package. Location and clean rooms are the highlights of this hotel. Lido Beach Hotel Pattaya is a great 3-star property in Pattaya. It boasts of quality living on an affordable budget. The hotel offers a comfortable shelter for all kinds of travelers, be it business and leisure travelers or couples/honeymooners. The hotel is just a 1 minute walk away from the beach so couple and families can just walk over and have a wonderful evening. The property also boasts of its attractive design and modern-day amenities including ticket services, luggage storage, airport transfer, car parking, 24-front desk and much more. Further, its warm hospitality and welcoming staff helps offer memories for a lifetime. 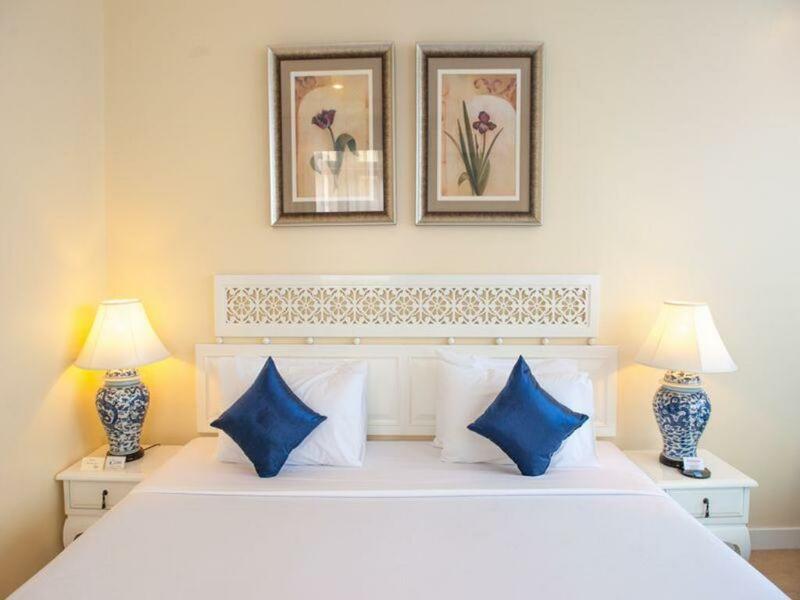 Its proximity to the nearby tourist attractions like The Avenue Pattaya, Seafari Diving Center and Royal Garden Plaza makes it a compelling choice for vacationers. Lido Beach Hotel Pattaya is strategically located just far enough from the entertainment hubs to offer a peaceful setting while still having an option to enjoy just walk over to the heart of South Pattaya. Lido Beach Hotel Pattaya with friendly staff has a host of room options to choose from, depending on the needs of the guests. The variey of rooms and apartments includes 3 Bedroom Family Apartment, Junior Apartment, Studio Apartments with Sea View, Superior King Room, Superior Suite, Deluxe Double Room, Standard Double Room, 2 Bedroom Apartment, Deluxe Twin room and 2 Bedroom Family Suite. All the rooms offer free wi-fi with high internet speed The rooms are air-conditioned and have a TV, private bathroom with free toiletries, hairdryer and some of the rooms have a separate seating area. Guests can use the full-size fridge, telephone, and laundry facilities as well. The Superior Suite has a lounge area, free newspaper, and microwave. The Studio Apartment has a kitchenette, dining setting and views of the sea from its balcony. Lido Beach Hotel Pattaya boasts of an on-site restaurant serving delectable dishes. It maintains a free parking area, 24 hour front desk, travel desk and shared lounge area. All the hotel rooms are equipped with modern amenities and complimentary wi-fi. The hotel also offers ironing, laundry, ticket service and daily maid service. It maintains non-smoking rooms but there is also a dedicated smoking area. The staff is friendly and ready to help with all kinds of queries. There are on-site shops as well from where guests can by souvenirs and gifts for their loved ones. Lido Beach Hotel Pattaya features an on-site restaurant that serves delicious Thai food. Guests can get breakfast in their rooms as well. There is also a snack bar for people to grab a quick bite. There are various restaurants in close proximity to the hotel like The Kitchen Pattaya Beach, Fra Pattaya and Casa Fellini. They serve European, Asian, Thai and international cuisines. Therefore, there is no shortage of food options. One can also enjoy a cup of amazing coffee at the on-site coffee shop. When it comes to offering comfort and relaxation on a budget, Lido Beach Hotel Pattaya does it quite well. People traveling with families or couples will have a great time here. Its location close to various tourist attractions makes it a compelling option for travelers. It is just a stones throw away from the entertainment hubs of South Pattaya. Lido Beach Hotel Pattaya Thailand is about 30 km from U-Tapao Rayong Pattaya International Airport. Does the hotel offer free wi-fi? Yes, the hotel provides free wi-fi. Guests can try delicious Thai dishes at the on-site restaurants, enjoy breakfast in the comfort of their rooms or just relax and enjoy the free wi-fi. Buy memorabilia at the on-site shops or sit and watch TV while interacting with other guests at the shared lounge area. Lido Beach Hotel Pattaya Thailand is located close to tourist attractions like Royal Garden Plaza, The Avenue Pattaya and Seafari Diving Center. Is there an on-site restaurant? Yes, the hotel has an on-site restaurant that serves Thai cuisine. How far is the hotel from The Avenue Pattaya? The hotel is approximately 750 metres from The Avenue Pattaya which means that guests can just walk over to the mall. If guests are looking for a comfortable, clean and budget friendly stay in Pattaya, Lido Beach Hotel Pattaya Thailand is a great option. It provides all basic amenities and facilities to all guests. The staff is welcoming and dedicated to making sure that the guests have the best time. The hotel offers a true Thai style experience for the guests looking to experience Pattaya in its true form. The rooms have been recently renovated and installed a 5-stage water filtration process making sure the water supply is as clean as it can be. The hotels location is a great addition to its overall feel. It is peacefully located conveniently away from the entertainment hub of South Pattaya. Guests can just walk over the hubs and experience the culture of the city. The beach is also just a stones throw away. Couples or families with children can have a wonderful evening, making unforgettable memories. With a host of facilities and a variety of room options, Lido Beach Hotel Pattaya Thailand offers a comfortable experience away from the busy city life.